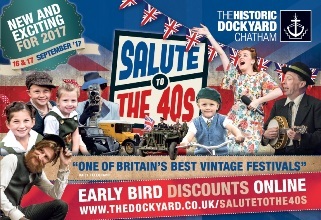 It's time to be transported back to the 1940s, with one of Britain's best vintage festivals* at The Historic Dockyard Chatham on the 16th & 17th September 2017. Girls make sure your Victory roll hair do is in place, and guys - take your vintage Gentleman's suit out. This year's NEW and EXCITING additions are ones not to be missed. Celebrating forces sweetheart Vera Lynns 100th Birthday, we will be in full swing just as the 1940s were, with a weekend packed full of sing-a-long and dance 'till you drop entertainment. We have a VINTALICIOUS line up including big band performances from The Glenn Miller Orchestra and The Hotsie Totsies. Vintage music will also fill the air from a variety of fabulous acts as well as comedy, variety acts, dance workshops and performances to tip top it all off. Don't miss out on seeing the dance troupes of Cinque Port Lindy Hoppers, Medway Lindy Hoppers and The Lindy Kicks who will get you dancing with opportunities to try for yourself. If you have your vintage outfit already, join in with the atmosphere of the thousands that come dressed as Land Army girls, in Military Uniform, House Wives and Washer Women, little Evacuees, vintage Gentleman's suites, glamourous swing dresses etc. But fear not if you haven't found the perfect outfit yet - we have vintage shopping available on the day! For the collectors and fashion enthusiasts there will be plenty to admire and shop for from fashions, accessories, jewellery, uniform and so much more. The vintage fun doesn't stop there! Being in the prime location of The Historic Dockyard Chatham, which has its own 1940s film set location; there will be home front displays and Military camps which complement the Dockyard site. On hand to talk everything WWII, don't miss our vintage and military dressed re-enactors wandering and cycling the streets. Visit our 1940's Street, a bombed-out house, anti-aircraft gun display, and vintage barbers, and don't be surprised by a 'Royal Visit' during the day, plus so much more! We also have the Vintage Fashion Parade which everyone dressed in their best vintage attire can get involved with. If you forgot to have your battle breakfast fear not, food rationing is not strict at The Historic Dockyard Chatham with many wonderful outlets on site to choose from ranging from Cream Teas to Ploughman's, traditional fish and chips or doorstep sandwiches and Kentish pies. In addition to this themed caterers dotted around the site serving everything from bacon butties and gourmet burgers to teas, cakes and bread pudding will keep you going for all the living history this vintage packed weekend has to offer! Animating the site will be the Dockyard locomotives running up and down the tracks across the site, plus hundreds of 1940's military and civilian vintage cars, buses, trucks and motorcycles. See the 'Coming Home' parade on both days when these vintage machines will travel around the Dockyard. And if you're still struggling for things to do (and let's face it - with a line up this fun-packed that will be difficult! )…find out what it was like to be in an air raid evacuation, in an Air Raid Experience where our ARP Warden will lead you into our WWII shelters and give you a history of an air raid. There will be gun firing from our very own Second World War destroyer HMS CAVALIER on both days as well. Not forgetting our 1940's street, where you can go and enjoy a pint from our pub, pick up a gift from our old fashioned store or buy some treats from our vintage sweet shop. Be sure to make the most of the photo opportunities by our bombed out house and underground station! So join us for one of Britain's Best Vintage Festivals for the biggest and best Salute to the '40s, the most popular event for group visits! So don't forget to book your discounted group rates now!